the rest of today and tomorrow off from blogging. my first ever sidewalk art sale! 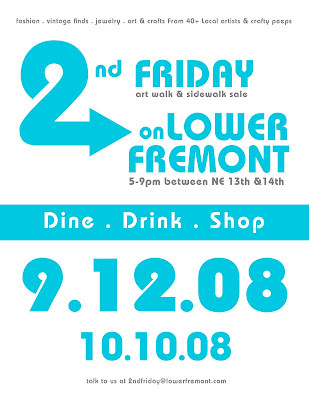 lowerFREMONT – 2nd Friday! I’m participating, along with 40+ other artists, in an art walk & sidewalk sale tomorrow! I’m super excited about it. from 5pm – 9pm tomorrow, Sept. 12, dine, drink & enjoy fashion, vintage finds, jewelry, art & crafts from the lower Fremont shops, guest artists and local crafty peeps! it’s on NE Fremont, between 13th and 14th streets. I’ll be there next to the lovely Amy Nieto, so be sure to say hi! I’ll have some note cards, recipe card sets, gift tags and more. Wish I could be there! Good luck! good luck alyson and have a great weekend! I so wish I was in Portland! Good luck!! Super fun to meet you and dlb last night, you’re even sweeter in person! Thanks for the recommendation of creative hotlist, I’ll be sure to check it out when I’m ready for job hunting :). So nice to meet you in person and to be the owner, now, of one of your sweet designs. It was nice to put a face with the beer-loving blogger.